View our chart of licensed activities by clicking here. Read our analysis of the law by clicking here. Did you know that there are dozens of activities that cannot be provided as a LLC in California? Most states permit professionals to render services through a professional limited liability company. But that’s not the case in California. In California, professional services may be rendered by a professional corporation, but not by a LLC. The lunacy is that dozens of other kinds of businesses are also prohibited from forming LLCs. Basically, if the business has to be licensed in California, it can only be operated as a LLC if the statute expressly permits it. First, do you have to be licensed, certified, or registered under the Business and Professions Code or one of the other statutes to provide the services legally in California? If not, then you can provide the services through an LLC. Second, if you are required to be licensed, certified, or registered, then are the services “professional services,” (e.g., accounting, law, medicine). If so, then you cannot provide the services through an LLC. 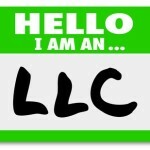 Third, if you are required to be licensed, certified, or registered but the services are nonprofessional, then you can provide the services through an LLC if the Business and Professions Code or one of the other statutes specifically says you can; otherwise, you cannot provide the services through an LLC.